We want to make The Robin Hood, Clifton Reynes a top venue for food and entertainment. An Alternative Ball is just like a Charity Ball only it's £35 a ticket rather than £75 a ticket. The added bonus is that there is no raffle or auction. In fact the first one we are doing is a Rock and Roll Ball. For your £35 you get a 3-course meal and a good old style Rock and Roll band. You can dress in Rock and Roll style if you choose - and indeed there will be a prize for the best-dressed couple - but you are under no obligation to wear anything other than smart casual attire. "We are trying to put on a ball that is affordable for most people." Simon has to put up the marquee and do the food and I put in the stage, organise the band and the publicity. This isn't a kick against charity events, but they are quite expensive and the way we're doing it leaves a bit of profit in it for us, although not much once all the overheads have been taken out. To be honest, the charity events organisers have to earn money otherwise they couldn't afford to do it. So all we're doing is giving a bit of top class entertainment and food without the charity aspect on this occasion to make it more affordable. I may well go around the tables doing a bit of close-up magic; maybe even dressed as a Teddy Boy. We're doing some events, such as this one, in the marquee and some on the large stage outside. In the old days, we used to get people like Kenny Ball and his Jazzmen and Chas and Dave playing, but old Kenny has now gone to the great gig in the sky and Chas and Dave tend only to be playing occasionally. So we're turning our eye to others. We are considering Showaddywaddy if we can get them believe it or not. Then to put a touch of class we're chatting to Jacqui Dankworth about an evening which could be great. We want to make The Robin Hood a top venue for food and entertainment, so keep your eyes open, or contact me if you want to be kept in the loop. And if we get a good sponsor, we'll put on Jools Holland. "That would be a blast wouldn't it?" 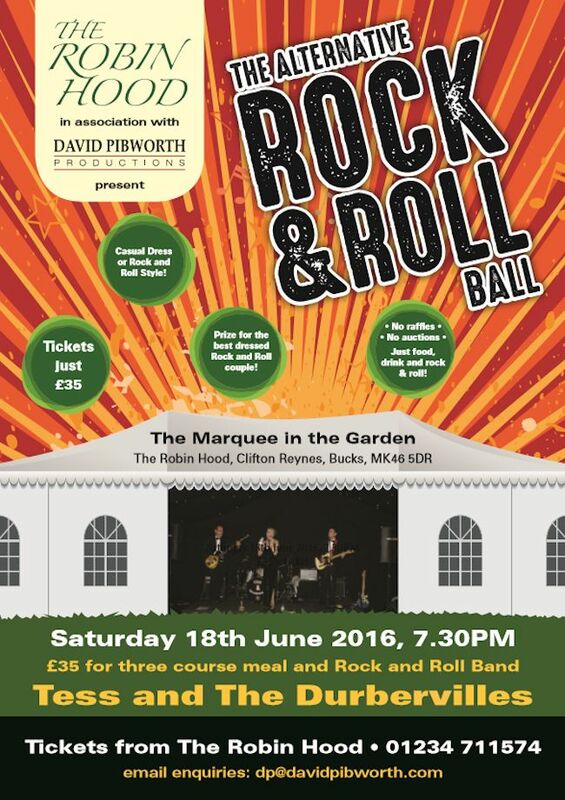 Get in touch with me to secure your tickets for the Rock and Roll Ball. We can only get 120 people in the marquee and it's going to be brilliant.